Grater and storer set with four interchangeable stainless steel blades. 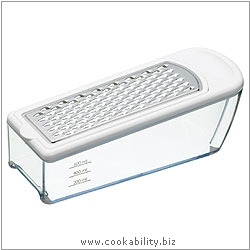 Makes grating, slicing and zesting easy, less messy and more hygienic. The container has measuring marks in millimetres and cups. Use to store excess food. The blades store away neatly in empty container. Rubber non-slip feet.